Of the hundreds of Hong Kong movies I've seen, I don't think I've seen anything quite like Ringo Lam's School on Fire. An incredibly angry and depressingly bleak film that has a rawness, energy and vitality that few other movies can match. Lam once again proves the level of intensity he is able to wring out of a screenplay is incredible. School on fire reveals how the Hong Kong education system, and in it's larger view Hong Kong's society in general struggles with the problem of the Triads. 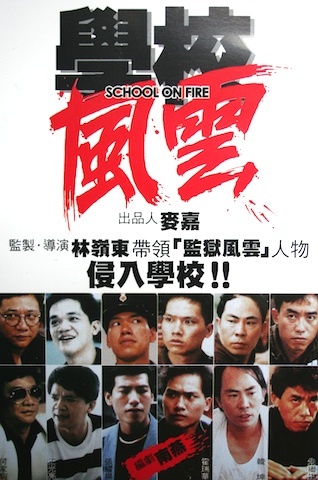 Highlighting the infiltration and recruitment of pupils by the Triad gangs, the film features many of the ways they make their money including extortion, child prostitution and drug dealing. This results in the teachers and pupils being powerless to do anything about the problems within the school. The situation is no less desperate outside of school with a team of police just as helpless at protecting the innocent from the lawless thugs. From the very start of the movie you know you're in for a rough ride, in the establishing shots it soon becomes clear anarchy rules the school, the place feels as though it could combust at any second. 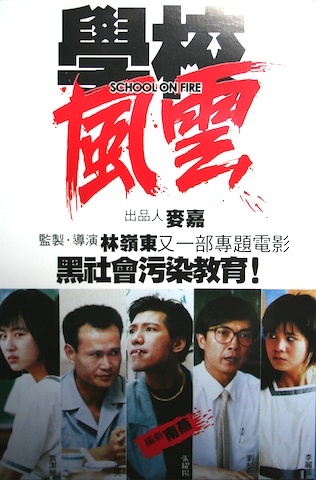 The catalyst of the story is a fight outside school where one of the pupils gets involved with a triad member, this ends in a tragic death and a serious situation for Chu Yuen Fong (Fennie Yuen Kit Ying). Facing unrelenting pressure from all sides after witnessing the tragedy, the police trying to make her testify and Brother Smart (Roy Cheung) bullying, humiliating and terrifying her not to. Trapped in a downward spiral of anger and fear, those closest to her are pulled down with her. Lam coaxes some fantastic performances from pretty much everyone in the film. 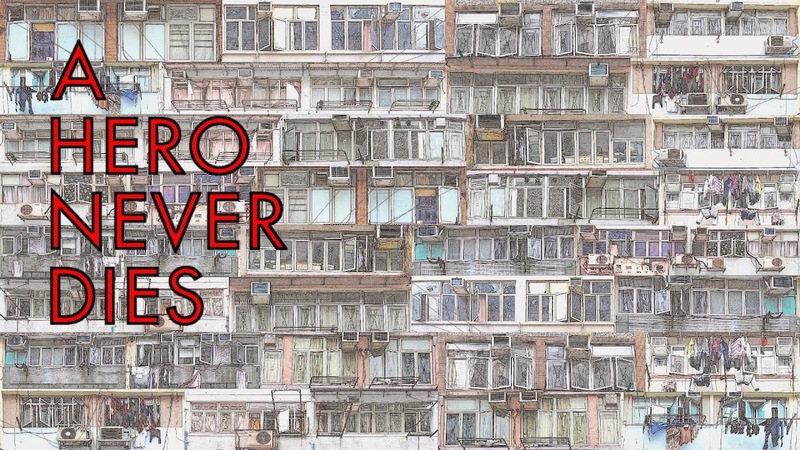 Instead of the high melodrama we would normally see in a Hong Kong film such as this, Lam goes for an almost naturalistic docudrama feel and much of the acting is uncomfortably realistic. Particularly impressive are the teenage girls the story revolves around, Sarah Lee Lai Yui and the aforementioned Fennie Yuen Kit Ying. Roy Cheung is excellent in another of his familiar evil Triad boss roles, this is probably the best I've seen him in this kind of role, which should tell you he's a particularly nasty piece of work. In fact he's so evil it almost goes too far and into the realms of pantomime villain, Cheung makes him feel real enough to just about avoid this. Damian Lau plays the girls teacher, he is perhaps the character who it's easiest to identify with and his sense of frustration at what happens to them is palpable, you totally feel it with him. The violence running through the film is startling, it's quick, harsh and feels brutally realistic, with no attempt made to glamourise or stylise it. This results in a shocking immediacy that adds great power to the film. As strong as School on Fire is, it does have flaws, the main one being the sheer amount of violent incident packed into it's running time occasionally feels a little too much and slightly dilutes the otherwise almost real feel of the film. The other issue I have with the film is the translation on the Joy Sales dvd is unfortunately quite poor, a better one may have made the film even stronger. Overall I think the anger charging through the film overcomes any of it's problems. The overwhelming feeling of helplessness and pressure and the inevitable releases of this intensity throughout, right through to the powerhouse ending, leave you with an astonishingly powerful film. Films like this one are few and far between, and even more so from Hong Kong, not surprisingly the film had censorship problems and it's unclear as to how the film would have been in Ringo Lam's original cut. What we do have is a film with no easy answers to the questions it raises, but with questions so raw, maybe it's enough just to ask them! Totally fantastic film. Is there a BluRay anywhere? I just recently received this one myself, Martin. Will hopefully watch it before the weekend. Sounds fantastic. Is this film available on DVD or Blu ? Phantom, I can't see this ever receiving a blu ray release unfortunately, who would buy it outside the two of us? Brian, Would love to hear your thoughts. Wes, The Joysales dvd is still available and it's cheap too. I would highly recommended it despite it's shortcomings. Thank you, your comment just made my (long and dull) day, hope you enjoy (actually I'm not sure that's the right word) your revisit. Over on Facebook I found out earlier a guy in America is screening a composite "uncut" version next week, wow! Where exactly is this being screened? Can't find the link. Yes, maybe we'd be the only taker. I'm sure some distribs would be very surprised what Martin and Mark would pay for some titles on Blu. I'm sure many would be surprised Mark. I'm the one putting together and screening the composite version. I have already re-written the very poor subtitles and even added titles to the "what happened to" part at the end. Comparing the two versions isn't easy though, as a lot of the cuts are small, and the uncut VHS I have is poorly cropped from 1.85. Does anyone know if the laserdisc is the uncut version? And if so, is it widescreen? I'd prefer a better source to work with if given the option. Oh, and if you guys know anyone in Philadelphia or the surrounding area (NJ/NY/PA) who would be interested in the screening, please let them know. This is obviously a labor of love and I want as many people as possible to see it. Thanks for getting in touch, I'd have loved to be able to support you with this, just the small matter of the Atlantic to prevent me unfortunately! As far as I'm aware the original Lam cut has never surfaced on video anywhere, so I'm intrigued as to where your VHS of it originated? I'd love to read your subtitles too, have you retranslated completely or spruced up the ones on the dvd? One final question, have you done anything like this before? "I'm intrigued as to where your VHS of it originated?" It was sent to me by a fan of the film. "I'd love to read your subtitles too, have you retranslated completely or spruced up the ones on the dvd?" Spruced up the ones on the DVD. I did the same thing with the composite of Bullet in the Head I screened a few weeks ago. That composite featured the piss drinking scene and the boardroom ending. I've done a few of these before, like with Burn! and Hell in the Pacific, trying to restore what the director intended but the studio took away. Great work, how have the screenings gone down with audiences? I remember seeing a double bill of City on Fire and Bullet in Head at Chinatown Cinema in Melbourne when Mark used to do them. 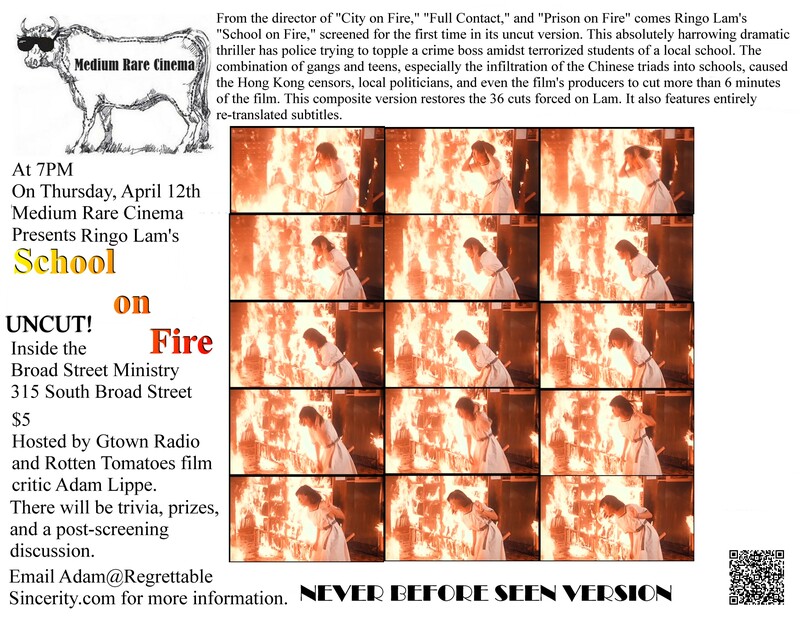 Unfortunately the print of School on Fire was too damaged so they could not screen it at that time, was the early 2000;s I believe. They used to screen a more recent release with an older movie and I do remember Fong Sai Yuk 1 & 2 and Police Story 1 & 2 screening in their program. These days the new releases go to the multiplex, the last big film they screen was a sneak-preview of Kung Fu Hustle and also CJ7. I think they may still screen Chinese New Year specials. Tim, that sounds like a really exciting time to be in Melbourne, and with Mark's impeccable taste in Hong Kong cinema how could you go wrong?